Wishlings member Zedwick was kind enough to request a tagging feature for items on their wish list. We thought it was a great idea so we've implemented it! Now you can use tags when adding new items, which will be visible on your public wish list. 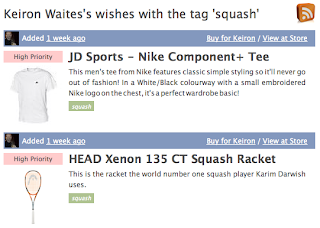 You can use tags to create subsets of items, for example 'clothing' or 'for my birthday'. When you click on a tag only the items with this tag will be shown.